Are you an absolute beginner? Cheap Singing Lessons London - Why It's a Bad Idea! 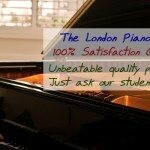 Singing Lessons in London - Are You Looking for Great, Fun & Exciting Singing Lessons in London? Why a great singer is not always a great vocal teacher! Why Should You Take Singing Lessons With the London Music Institute?